If you have a baby, a diaper bag is the one thing you wouldn’t want to leave your home without. You will need a bag not only to hold diapers, but wipes, extra baby clothes, toys and much more. A good diaper bag will hold all these and some mommy stuff without weighing you down. If you are not ready to down your stylish handbag yet, you will be happy to know diaper bags offer different styles and designs that will work just fine for you. There are also some simple but really useful diaper packing hacks that will enable you save more space and carry more in your diaper bag. Today we look at ten of the best diaper bags that will come in handy for both you and your baby. We also touch on the essential features to consider when buying a diaper bag. How do you want to carry it? Who will be carrying it? Do you use a stroller? A large-sized bag is ideal if you have more than one child or if you are out of the house for long. Consider a small one if you have one child and if you are out of home for short hours since you won’t need to carry much. You will need to carry multiple things. Therefore, you need a diaper bag with multiple pockets. Consider everything you may need when outdoors before making your selection to ensure it works perfectly. The pockets should also allow you to organize your items with ease so that you can locate anything you need without ripping the contents apart. An insulated pocket will keep your baby’s beverage or food at the right temperature for long hours. Consider one with a large insulated compartment for oversized baby bottles or with multiple insulated pockets if you’ll need to carry more than one bottle. First, ensure the fabric is easy to clean. It should also be durable to ensure years of service. The straps should be strong to endure the weight of the bag and also comfortable. Waterproof fabric on the exterior will keep your bag from rain while an internal waterproof-lining will prevent leaks in case of accidents with liquid stuff. Accessories are great to ensure you get the best out of anything you purchase. Some important accessories you should consider in a diaper bag include a changing pad, luggage feet to keep your bag clean and safe from damage when you place it on the floor, a ring to keep toys within reach among other features. Why we like it: The Ju-Ju-Be Legacy collection backpack opens like a suitcase and has multiple smart pockets to make packing easier. Its fabric is stain, mold and mildew resistant. It is versatile, and you can carry it as a tote bag using the quick-grab handle, a messenger bag or a backpack. It comes with a changing pad and is machine washable therefore easy to clean. The Ju-Ju-Be Legacy backpack quickly converts to a tote bag, a messenger bag or a backpack when you want it to. It has cushy memory foam straps that are also non-slip so you won’t have to struggle with the straps falling off your shoulders when carrying the baby. The backpack opens like a suitcase to make it easy for you to pack. The main zipper is spacious to carry most of what you’ll need. It has two bottle pockets on the exterior and an easy to access pocket for your phone. The outer fabric is Teflon treated so you won’t have to worry about stains. The inner lining has also been treated to keep your diaper bag from odor-causing bacteria, mold, and mildew. It comes with a memory changing pad that comes in handy when on the go. We also like the luggage feet that keep your bag clean and in good condition when you place it down at the park. The metal zippers are durable and will hold for years. The bag is machine washable thus easy to clean. The ergonomically curved and padded straps coupled with the breathable mesh at the back panel keep you comfortable when carrying the bag. The backpack design also leaves you hands-free so you can take care of your little one. It offers ten color options so you can choose what suits you best. It comes with a lifetime warranty for manufacturing defects. The Ju-Ju-Be Legacy is extremely convertible, and you can easily wear it over your shoulders, carry it with the top handle or as a backpack. It has multiple storages to help you remain organized. The back pocket features crumb drains, and the bag is machine washable thus easy to clean. 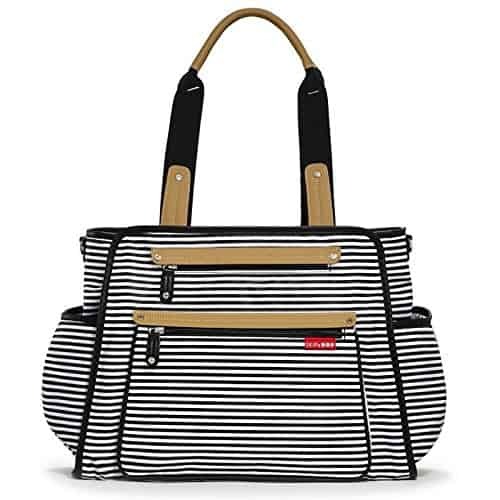 It is stylish, offers multiple color choices and has a luggage feet making it an excellent diaper bag. Why we like it: The Skip Hop grand central diaper bag offers both elegance and functionality making it perfect for moms with style. It has 11 pockets to carry all of mommy’s and baby’s essentials. The 2 insulated side pockets fit extra-wide baby bottles. It has a zip-top closure on the main compartment to keep your stuff from falling off. It has a strong yet lightweight material and a water-resistant lining. We love that it can be carried over the shoulder or attached to the stroller. How about a diaper bag that separates mom and baby sections? The Skip Hop grand central diaper bag offers you this. First, it has 11 pockets so you can be sure it will fit all that you need to carry. The baby’s section has a clear wipe pocket and toy loop whereas the mom’s section includes a zipped pocket, phone pocket, and a fleece-lined sunglass pocket. It has two insulated pockets to hold extra-wide baby bottles. The zip closure on the main pocket ensures your bag’s contents do not fall out. The diaper bag hangs neatly on the stroller releasing your shoulders from its weight. It can also be carried over the shoulders and has cotton tote straps for comfort. It comes with a cushioned changing pad convenient for changing your baby on the go. The tote diaper bag has a compact modern design that any mom would love. It has a sturdy yet lightweight material to guarantee years of use without compromising on its weight. The water-resistant lining protects your items from leaks and is easy to clean. It comes in black stripe and cinnamon so you can pick what works best for you. The Skip Hop grand central diaper bag features a classy design with light brown leather accents perfect for any mom. We like that it has separate pockets for mom and baby. The multiple pockets and roomy compartments are not only easy to organize but also ensures you carry everything you need without feeling burdened thus convenient for travel. Why we like it: The Skip Hop Duo diaper bag has a lot of pockets that includes a fast-access cell phone pocket. It attaches to the sides of any double stroller making it great for twins. Its shoulder straps are removable, and you can also carry it as a tote. We like the contrasting lining that makes it easy for you to find everything inside and the magnetic closures with a zipper on the main compartment. The Skip Hop Duo diaper bag comes with shuttle clips to fit any double stroller perfectly taking off the weight burden from your shoulder. It comes with 16 pockets and a roomy interior enough to hold all your stuff and baby gears for your twins. It has magnetic closures throughout with a zipper on the main compartment so you won’t have to worry about your baby stuff not being secured. The bag comes with two insulated bottle pockets on the side so you can easily reach out for your little ones’ bottles. It also has a cushioned pad for you to change your baby comfortably. It has a D-ring to hold your baby’s toys which comes in handy when they start throwing tantrums. The bag makes it easy to find anything you need without ripping everything apart thanks to the contrast lining. How about a diaper bag that gives you the choice of carrying it as a tote bag or a messenger bag? The Skip Hop Duo diaper bag offers you that. The multiple pockets help you get more organized, and the cell-phone pocket is conveniently within your reach. It is made of polyester meaning it can take a beating quite well. It comes in different neutral colors so you won’t have a hard time picking one that best suits you. The Skip Hop Duo diaper bag comes with a roomy interior with multiple pockets and can attach to a double stroller making it perfect for you if you have more than one child. It comes in neutral colors thus an excellent choice for both parents. We like that it can be carried as a tote bag or a messenger bag and comes with an easy to access pocket for your phone. Why we like it: The Bag Nation diaper backpack holds everything you need on the go, and you can strap it to the stroller giving you total hands-free. It is water resistant and has 14 compartments to allow you to organize all your stuff. It comes with a large changing mat and a sundry bag. The insulated pocket holds multiple bottles all at once, and the padded shoulder straps give you an easy time when you are carrying it. The Bag Nation diaper backpack is spacious enough to hold all your baby’s essential items. It comes with stroller straps to give you total hands-free. 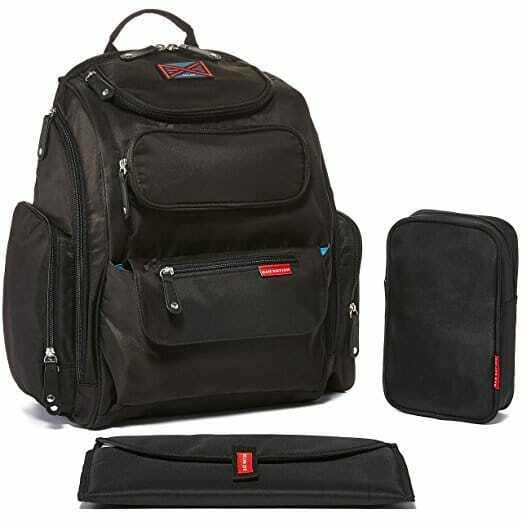 It has fourteen pockets to allow you to organize all you need with ease. The multiple compartments allow you to separate clean clothes from dirty ones. It features a big insulated pocket that can hold more than one baby bottle and a pocket specifically for wipes convenient for messy moments. The included changing mat is large and durable perfect for everyday use. It features a strong zipper to ensure all your essentials are well secured. The backpack has ergonomically padded shoulder straps to guarantee you an easy time carrying it even when fully packed. Its back panel is also padded and has a breathable mesh for maximum comfort. Again, the twill polyester construction gives you a water-resistant bag so you won’t have to worry about rain and spills. The durable material, non-fraying stitches, and strong zippers ensure you will use the bag for years. Lastly, the Bag Nation backpack comes with a lifetime warranty, and you can also use it as a real backpack once your baby grows up. 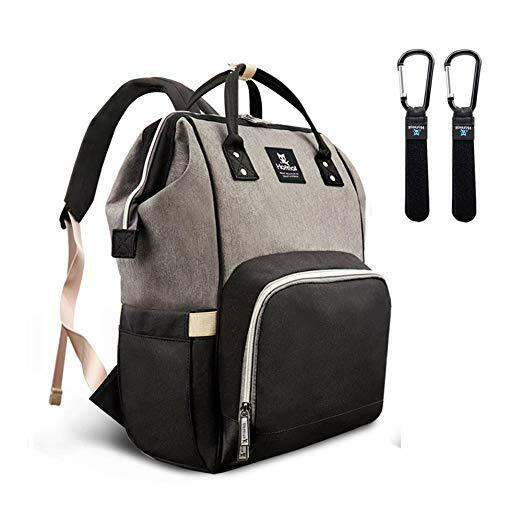 If you are looking for the best backpack diaper bag that can hold all your essentials, look no further than this backpack from Bag Nation. It features multiple compartments and is durable to ensure years of use. The padded shoulder straps and included stroller straps give you total hands-free perfect for on-the-go parents. Why we like it: The HapTim multi-function diaper bag comes with a big central compartment, opens widely and has 15 pockets thus simple to organize. It is durable and comes with insulated pockets for your baby’s bottle. It has stroller straps and wide padded shoulder straps therefore perfect for on-the-go parents. How about a diaper bag that ensures you carry everything you need all at once? The HapTim multifunction diaper bag comes with many pockets and a huge central compartment to ensure you take along all you need. You will love the back-pack design that comes in handy during trips. It features 3 insulated pockets to keep your baby’s bottles at the right temperature throughout. You will like the quick to access side pockets to hold wipes. The changing pad allows you to change your baby’s diaper while on the go. The backpack has a 3D breathable padded back and wide padded shoulder straps to ensure you are comfortable all day. It comes with stroller straps to take the weight off your shoulders. The adjustable buckles allow it to be carried by different people comfortably. 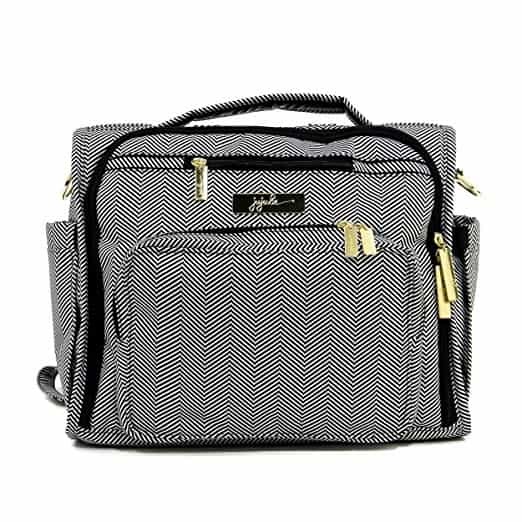 Also, the HapTim multi-function diaper bag offers a 30-day free exchange and a 90-day warranty so you won’t have to worry in case something goes wrong with the bag. The strong polyester fabric and reinforced shoulder straps guarantee you years of use. The hidden pocket at the lower back is perfect for your important stuff. The HapTim multi-function diaper bag is spacious and comfortable to carry making it an excellent choice for travel. The large capacity allows you to take everything you need yet it is small enough for you to carry on the plane. It is durable to ensure years of use and comes in neutral colors thus perfect for both mom and dad. The insulated bottle pocket is not so easy to access but once you get used to it you’ll love it. Why we like it: The Hafmall diaper backpack comes with one roomy compartment and thirteen separate storage pockets which include insulated pockets and wet cloth pocket to ensure you carry all that you need. It is made from a durable and water resistant fabric. You can carry it as a handbag, backpack or attach to the stroller. 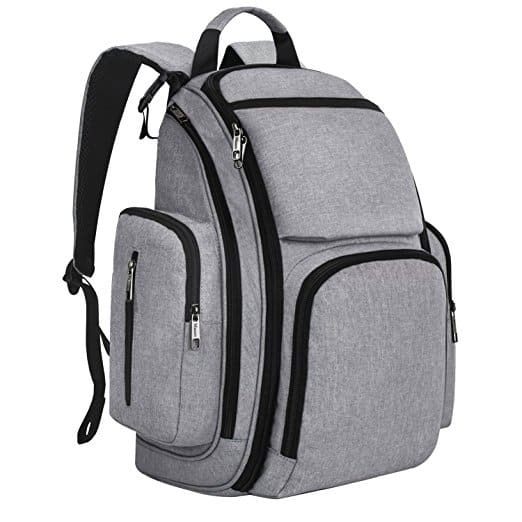 The Hafmall diaper backpack has a large capacity thus convenient for multiple functions. It has a large compartment to fit essential items both for you and the baby. The 13 separate pockets include three insulated pockets for your baby’s bottle, a wet cloth pocket for damp cloth diapers and a tissue pocket. When it comes to carrying, you can choose to use it as a handbag, backpack or use the stroller straps to attach it to the stroller. Both the external and internal fabric are water resistant meaning you are well protected from leaks and rain. It has two D-rings at the back of the bag for holding your baby’s toys within an easy reach. The Hafmall diaper bag has padded shoulder straps to ensure you can comfortably carry it as a backpack. The straps have adjustable buckles to fit people of different heights. Again, it is made of quality polyester that is water resistant to withstand rains and leaks. It is also durable and comes with sturdy zippers to guarantee long years of use. It offers a 90-day return period for those not satisfied with the bag. It offers four color options making it easy for you to choose what best works for you. You can pick the pink one for mom or the black bag for dad. It is also easy to hand wash so you won’t have to worry about messes. 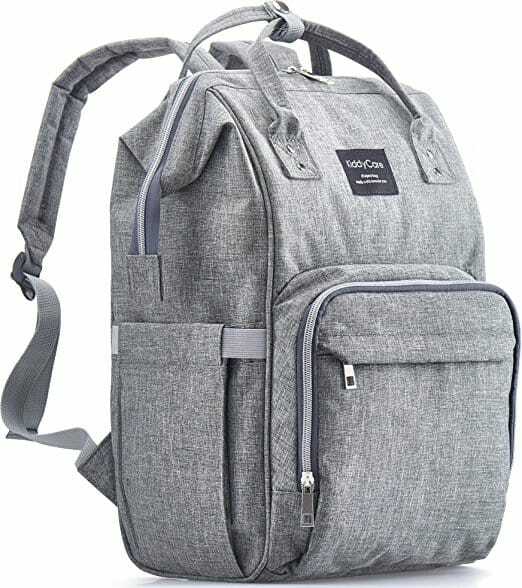 The Hafmall diaper backpack has a large capacity with multiple smaller pockets and is comfortable to carry making it perfect for travel. It is stylish and multifunction to allow you to carry as a tote bag, backpack or a messenger bag. It comes in multiple color choices thus perfect for both mom and dad. Why we like it: The multifunction diaper backpack from Absolute BTS is roomy to allow you to carry all your baby stuff. The multiple pockets allow you to organize all the items you need with ease. It has insulated pockets for baby bottle and an easy to access side pocket for tissues. It offers multiple ways of carrying thus suitable for traveling. It also features a USB or earphones slot. The backpack-design diaper bag frees up your hands 100% so you can use them for other things like holding your baby. It is spacious enough to hold all the necessary items you need while on the go. It has two big separated compartments with 17 pockets thus easy to organize all the stuff you need and to separate the dirty clothes from the clean ones. We love the insulated pockets to hold your baby’s bottle while keeping its contents at the right temperature and the side pockets for tissues to clean up messes. It also has a hidden pocket for your keys and other essential items. It is made of a waterproof fabric that makes it easy for you to wipe clean in case of spills. It comes with a stroller strap to allow you to attach it on the stroller and you can also carry it as a tote bag or a backpack. It is a unisex bag that mothers will love to carry as a tote bag while dads will love to carry around as a backpack. The high-quality fabric guarantees durability so you won’t have to worry about replacing the bag for years. It comes with a lifetime worry-free warranty that you will love. It is versatile meaning you can carry it as a diaper bag or as an everyday travel backpack. The earphones slot will keep you entertained all through. 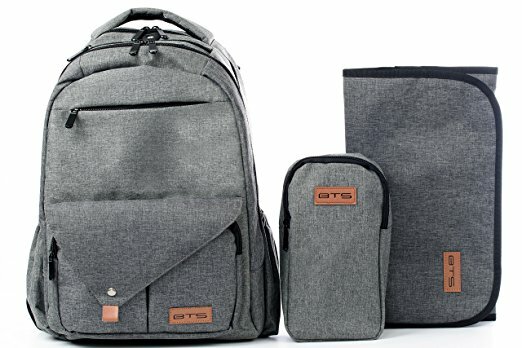 The multifunction diaper backpack from Absolute BTS is a stylish bag that is perfect for dads. It is durable to ensure years of use as well as waterproof for easy cleaning. The two roomy compartments make it travel-friendly as it allows you to carry all that you need when away from home. It offers multi-carry ways convenient for both parents. We love the small pockets to hold your phone, water bottle, umbrella among other things making the bag suitable for everyday use. 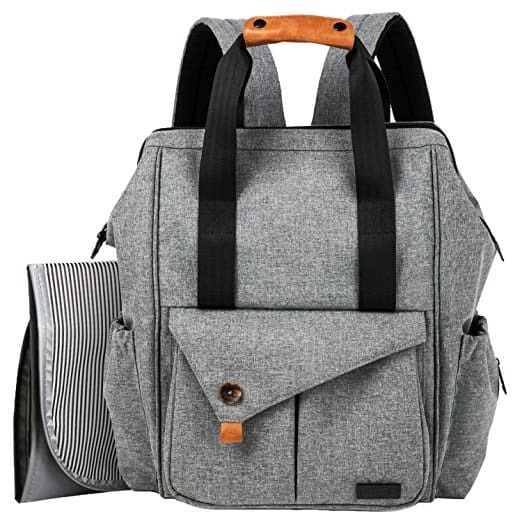 Why we like it: The Mancro diaper bag backpack features multifunctional pockets to hold everything from your laptop and tablet to shoes and food. It has stroller straps and a changing mat. The dual metal zippers ensure total security and the high-quality fabric guarantees durability. It has an easy-to-tote carry handle and thick shoulder straps to provide comfort when carrying the bag. The Mancro diaper backpack features multifunctional pockets that come in handy for day to day use. The two insulated pockets will keep your baby’s bottle at the right temperature while the side pockets will hold the baby wipes within an easy reach. It has two front zippered pockets for baby’s clothes and shoes and a zippered mesh pocket for towel and diapers. You will also like the large compartment to hold your laptop or magazines. The waterproof fabric keeps your essentials safe from leakages. It has stroller straps to allow you to attach it to the stroller and take off some weight from your shoulders. The main pocket has a dual metal zipper to keep your valuables safe. When it comes to carrying, the easy-to-tote top handle will give you an easy time when holding it like a tote bag. The comfortable back panel and padded shoulders also make it comfortable to carry on your back. The shoulder straps are adjustable thus suitable for individuals of different heights and it is also lightweight. It is durable to guarantee years of use and has a changing pad to allow you to change your baby’s diapers while on-the-go comfortably. It comes in grey and black colors, so it easily blends with your outfit. It is stylish, and both mom and dad will love carrying it. It is easy to wipe clean, so you won’t have to worry about your baby’s messy moments. The Mancro diaper backpack is made of nylon fabric that is both waterproof and durable. The numerous compartments make the bag suitable for shopping and traveling. The black and grey colors make it ideal for dad. The stroller straps, easy-to-tote top handle, and padded shoulder straps make it perfect for day to day use. Why we like it: The KiddyCare diaper bag backpack comes with 3 insulated pockets to hold your baby’s beverage at the right temperature. It has two side pockets for baby wipes and other items. It has 15 pockets for total organization and is made of high-quality cloth to guarantee both style and durability. You can hang the bag on a stroller or carry it as a backpack. The KiddyCare diaper bag backpack comes with 15 pockets that make it easy for you to organize your bag. The roomy space allows you to carry everything you need on-the-go for yourself and your baby all in one bag. The 3 insulated pockets keep your baby’s drink at the desired temperature while the 2 side pockets keep all you need within an easy reach. It comes with a button that allows you to lock both the upper handles so you can hang the bag on the stroller. The back straps are padded to ensure comfort when carrying the bag as a backpack. The backpack design makes it convenient for dads to carry as well as frees up your hands. The bag is made from high-quality cloth to prevent it from tearing at the seams to ensure years of service. The iron zippers are strong with an anti-theft security slot. You will like that its construction gives you an elegant look. It comes in 5 different colors giving you the freedom to select the one you like. The bag offers a lifetime warranty so you won’t have to worry in case something goes wrong with it. Its style and modern design allow you to use the bag as a normal handbag or backpack when your child grows. The KiddyCare multifunction backpack is lightweight yet sturdy therefore perfect for travel. It is roomy and will hold all your necessities with comfortable straps for easy carrying. It is easy to clean, stylish and offers great features at a competitive price giving you great value for your money. Why we like it: The cloth diaper bag from Yarra has two zippered pockets for clean items and dirty diapers. The zippers and the waterproof material guarantee leaks and odor are contained. It is stylish and can hold up to 7 cloth diapers. It comes with handles to easily carry or attach to the stroller and is easy to wash. There is no better way to carry your baby’s soiled diapers than with this cloth diaper bag. It has two pockets to allow you to separate the wet diapers from the clean ones. The zipper closures contain leaks and the awful odor. It features a snap handle for easy carrying on your hands, to attach to your stroller or hang on the closet rod. The high-quality stitching gives you a durable bag. It is waterproof thanks to the polyester fabric. It can hold 5-7 cloth diapers enough to keep your baby comfortable throughout. They are available in multiple colors and prints that any stylish mom will love. It also comes in different sizes so you can choose what works best for you. We love that it is hand washable for stress-free cleaning. 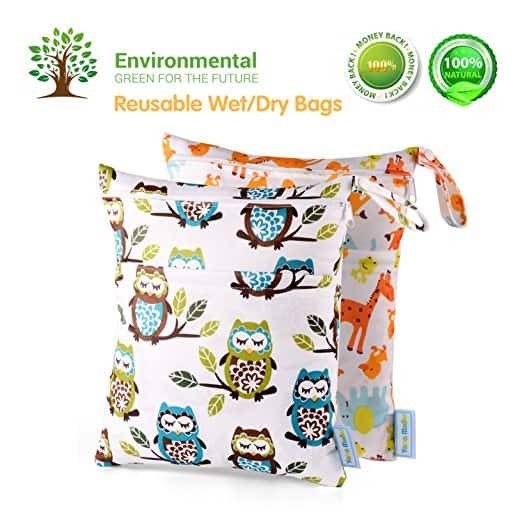 This cloth diaper bag holds not only wet diapers but also dirty clothes and wet swimsuits without messing the clean clothes. It also comes in handy at the gym to carry your work-out clothes. The 2 in 1 Yarra cloth diaper bag is waterproof and come with two zippered pockets that contain leaks and odor thus perfect for cloth diapers. It is also ideal for traveling since it allows you to separate your dirty socks, underwear, and swimsuits from the fresh ones. It is durable, easy to wash and stylish to keep all moms happy. Diaper bags come as a tote bag, messenger bag or a backpack. If you are comfortable carrying it over your arms, a tote bag is fine, a messenger bag for your shoulder and a backpack if you are okay with throwing it over your back. A backpack is convenient as it gives you hands-free to allow you to hold your baby’s hands or push the stroller with ease. You can play safe with a convertible diaper bag that allows you to switch from a tote bag to a messenger bag to a backpack with ease. How often do you leave the house and how long do you spend outdoors? If you leave your home for hours, you will need a large diaper bag that will hold all that you need while away. Also, you will need a spacious bag if you have more than one child and a smaller one for one child. You need space for your stuff too. You will need to carry your keys, sunglasses wallets among other things. Be sure to pick the right size for both you and your baby. Here is a guide on how to organize a diaper bag to make the best out of the available space. How do you plan on using the diaper bag? You need a spacious bag with multiple compartments for day trips or if you will be spending the weekend at grandmas. One with stroller straps come in handy when spending the day at the park. An everyday bag needs to be strong enough for durability and should come with secured pockets for your phone, keys and other stuff. If you plan on using cloth diaper, you will need a bigger diaper bag with roomy pockets to allow you to carry used diapers back home for cleaning without soiling other items in the bag. Remember cloth diapers are bulkier compared to disposables thus take up plenty of space so you need to fold them correctly to save on space. Diaper bags can have a zipper top, snap top or drawstrings. Of the three, a zipper will safely hold your items from falling out of the diaper bag, but it may be hard to close when the bag is fully packed. Not all diaper bags are unisex. Diaper bags come in different designs to offer everyone something. Some bags are too stylish, and dads might consider them feminine. Select the one you are comfortable with as a dad or mom. You can play safe and pick a unisex one that both of you can carry comfortably. You don’t want a bag that will force you to replace it in a few months. Get a bag with a strong fabric that is anti-stain, scratch resistant with non-fraying stitches to ensure years of use. The zipper should be strong to withstand day to day use. Also, consider one with a warranty to guarantee worry-free usage. Do you want a spot clean only, wipe clean or a machine washable bag? Babies can be messy, and you need an easy to clean bag for your convenience. If you plan on using a stroller, you need to decide on how you want to carry the diaper bag on the baby carriage. You need a bag that allows you to attach it to the stroller otherwise you will have to place it on the storage basket which will take up a lot of space. Consider one for a double stroller if you have twins. How much are you willing to spend? Diaper bags vary in cost. You need to work with a budget for you to have an easy time in your selection. While you don’t have to break a bank to get a good diaper bag, be sure not to compromise on the quality as it will cost you in the long run. 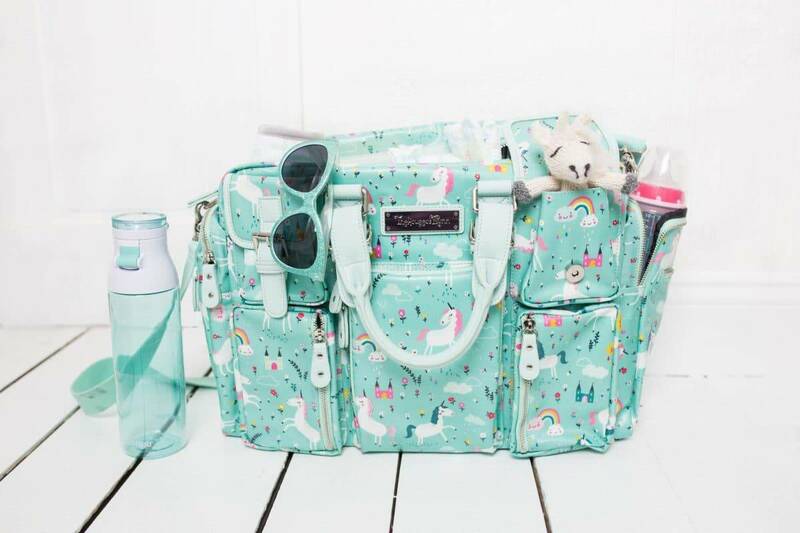 As a new parent, you should be prepared for overwhelming joy as well as many responsibilities and choosing a diaper bag to tote around your baby’s essentials is one of them. Well, choosing the perfect diaper bag for you depends on different factors that we have covered in this article. 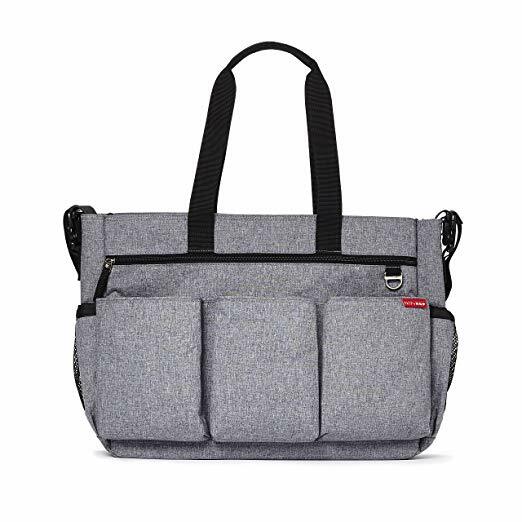 We have selected the best diaper bags you should consider in 2018 whether you are a mom or dad, for one child or twins and even for travel. We have picked the best in the market to offer you convenience, comfort, and functionality.